Kitchen sink. Even though you wash utensils with soap and water, there are chances of food particles getting stuck in corners and crevices of the sink. Scrub your sink thoroughly once a day and clean with bleaching powder once a week. Bedding. Dust and dirt collect easily on the sheets, covers, mattress and pillows, especially if you do not take a bath after returning home from work. This can be a breeding ground for dust mites. Make sure you wash the sheets and covers regularly, and also sun your pillows and mattress. TV remote & Computer keyboard. More often than not, we sneeze or cough directly on the remote or keyboard. Sometimes we may even touch them with our dirty hands or drop food crumbs over them. 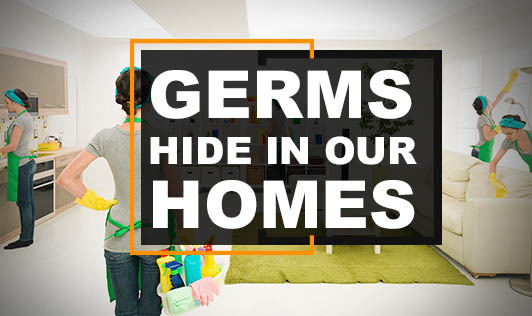 This helps the bacteria and viruses to make the remote and keyboard their homes. Cover your nose / mouth while sneezing or coughing. Do not touch anything with dirty hands, and wash your hands frequently. Toothbrush. Most of us do not dry our toothbrushes after use. Wet objects encourage bacteria to multiply quickly. Change your toothbrush often and keep them dry and clean. Mats & Carpets. Many have unfortunately given up the Indian tradition of leaving shoes / slippers at the entrance of the house. Dirty / dusty footwear worn in the house not only dirty your mats and carpets but also can be a source of infection and allergy. Mats kept at the entrance of homes and bathrooms are rarely cleaned in most homes. Many people continue to use wet mats outside the bathrooms without airing them or drying them in the sun. Make a rule of "footwear at the entrance" for everyone at home and your guests. Also clean your carpets and mats regularly.